This article is written to correct the regular misuse of these words by English learners and speakers on social media. Despite the obvious difference(s) between these words, social media users tend to use them interchangeably for reasons best known to them although the reason I have in mind is not far from ignorance. It is also important to state that these words are not just different in meaning but also in spelling. A surface examination of "everyday" and "every day" will leave you with no doubt that the former is a typical example of closed compounding while the latter is a perfect example of open compounding. 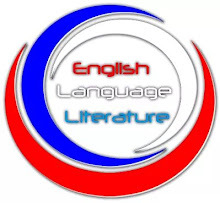 A closed compound word consists of at least two words which are written together, with no hyphen or space between them, e.g., headmaster, blackboard, dashboard, cupcake etc. On the other hand, an open compound word comprises at least two words that are written as separate words, e.g., in fact, a lot, for instance, at least etc. Please, note that a compound word functions as a single word and carries a meaning that is different from the meanings of the words which constitute it. Let's go to the crux of matter. "Everyday" can function as an adjective and a noun. Remember, an adjective is a word that describes or qualifies a noun. 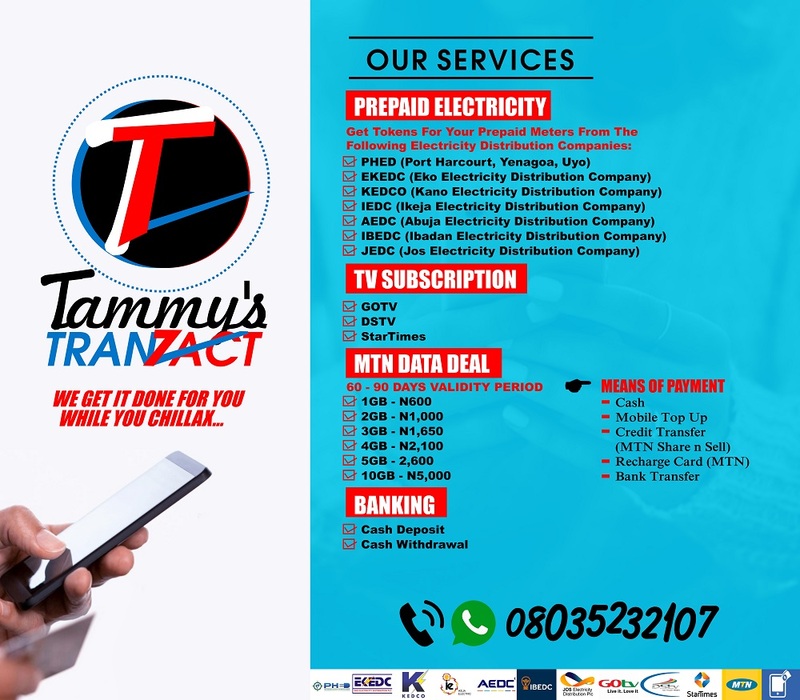 As an adjective, "everyday" is used to describe something that happens or is used every day, or something that forms a regular and basic part of your life, so it is not especially interesting or unusual, e.g., everyday life, everyday clothes, everyday experience etc. In all of these examples, "everyday" functions as an adjective because it describes different nouns (life, clothes and experience). Therefore, it is very wrong to use "every day" when describing a noun. For instance, you don't write "every day experience" instead of "everyday experience". i. Don't let the problems of everyday life get you down. ii. We are just an everyday family. 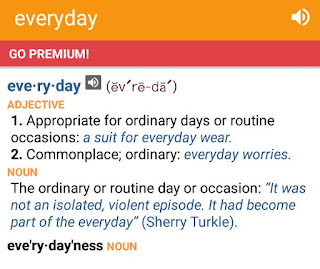 Although most dictionaries present "everydayness" as the noun form of "everyday", there are reputable online dictionaries where "everyday" adequately functions as a noun. As a noun, "everyday" means "the routine or ordinary day or occasion." 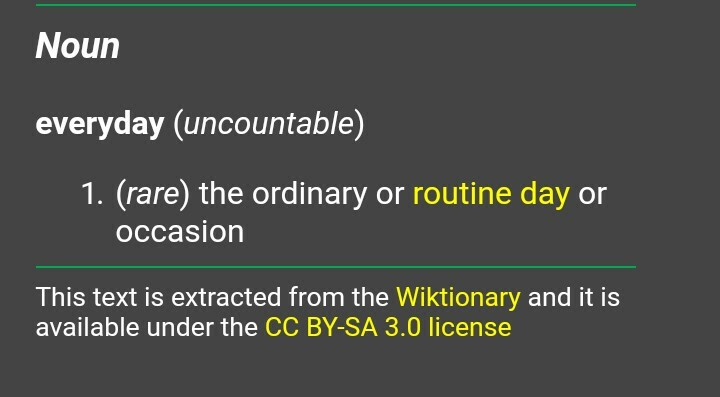 Below is a sentence example from dictionary.com showcasing "everyday" as a noun. "We use inexpensive plates for everyday." In the example above, "everyday" means ordinary occasion and is functioning as a noun. Therefore, the sentence simply means that we use plates that are not expensive for ordinary occasion. 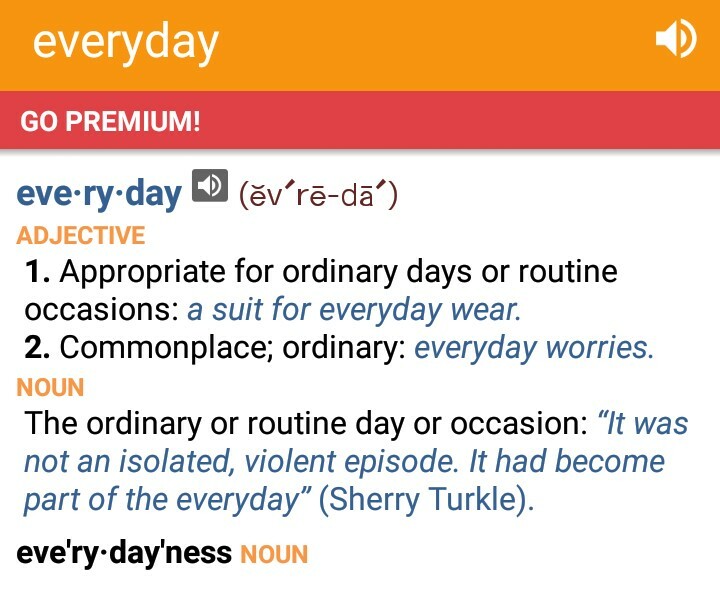 Unlike "everyday", "every day" solely functions as an adverb, that is, it qualifies a verb in a sentence. To be precise, it is an adverb of frequency because it describes how often an action is performed. Remember, the verb is the action (word) in a sentence. i. I wash my clothes every day. ii. My everyday experience in the university taught me how to read my books every day. 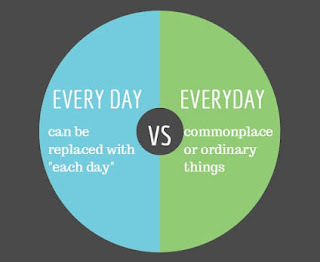 In these examples, it will be wrong to replace "every day" with "everyday" because of the grammatical function of the latter. Whereas "every day" in sentence one tells us how often the speaker washes his clothes, the "every day" in sentence two describes how often the speaker reads his books. And such grammatical function cannot be performed by "everyday". Also, note that the use of "everyday" and "every day" in sentence two is not unintentional and for mere fanciful purpose. 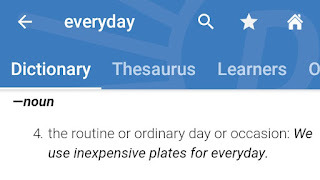 It is used to reiterate the fact that "everyday", which is an adjective, describes a noun whereas "every day", which is an adverb, modifies a verb. 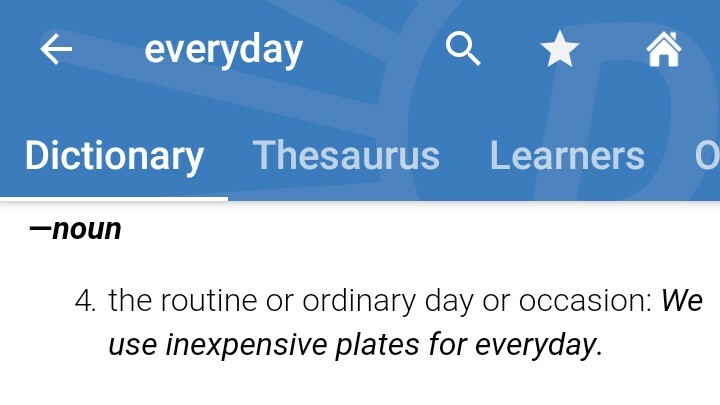 Obviously, "everyday" in sentence two is qualifying the noun, experience, as against "every day" which qualifies the verb, read, in the same sentence. Correct use of "everyday" and "every day"
The examples below show how you can use these words correctly. i. Don't let your everyday worries make you fail the test. ii. I don't get it. Do you mean you want to attend the party dressed in your everyday clothes? iii. I eat rice every day. iv. I have heard you. I will do what you said, but not every day. Wrong use of "everyday" and "every day"
On the contrary, the examples below show how these words are used wrongly. Therefore, you should avoid them. i. Don't let your *every day worries make you fail the test. ii. This looks like an *every day attire. iii. I eat rice *everyday. iv. I will do what you said, but not *everyday. From the above explanations, the dichotomy between these words is obviously and undoubtedly evident. 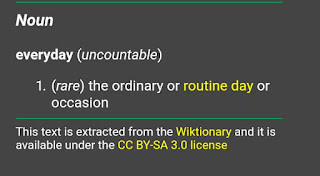 The absence of "every day" in most offline and online English dictionaries might have given many language users the leeway to use the words anyhow. Wow! This is a detailed explanation. Thanks, Tammy. It is well understood.